Change opens membership for those still working. 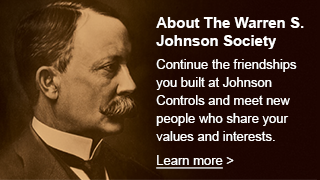 For 26 years our membership has been open to either Johnson Controls retirees OR those still working for JCI and having at least 20 years of employment with JCI. Due to today’s ever changing work environment, your Board of Directors has found more examples of individuals either still working for JCI, but short of 20 years employment, or still working but outside of JCI. Some of these individuals have expressed interest in our group. “anyone who has either retired from Johnson Controls Inc. OR has completed at least 10 years and is in good standing with the company. (ie; is eligible for possible rehire by the Company)”. This bylaws change was presented to the general WSJ Society membership meeting at the July 16 luncheon. It was moved, seconded, discussed and passed with a unanimous voice vote at that meeting. In non-Bylaws language this means we are now open for membership to those with only one half as long of employment (10 years), and those not yet fully retired, regardless of where they are still working. SO YOUR JOB IS TO SPREAD THE WORD! Since this newsletter is only mailed to our membership and the web site is probably unknown to those who would most benefit from this change, get the word out to any and all. Whether or not it applies to the person you are telling, they may have contact with another that would like to keep in touch with fellow Johnsonites from their years of employment. Then either come to a quarterly Milwaukee luncheon and see what new faces there may be, or contact a few closer to your “neck of the woods” and have your own luncheon or whatever. Every time I’m with a few Johnsonites, I hear storys of other connections going on between those with common interests or locations. This society of individuals has a life of its own regardless of some stodgy bylaws held here in this Brew City. If there is more we can do to enhance that broad network of connections let us know. It’s best to use the Suggestion Box under the Members Only tab. Or call me, as many of you have done for 40+ years.